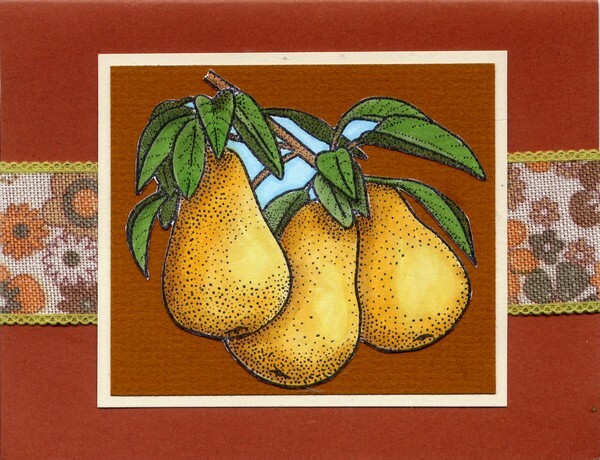 Today, on this day of Thanks, I would like to share a card featuring the Large Pears image from the Frantic Stamper line. To create this card I stamped it in Memento Tuxedo Black ink and colored with Copics. After trimming it out, it was double matted on rust and ecru card stocks. 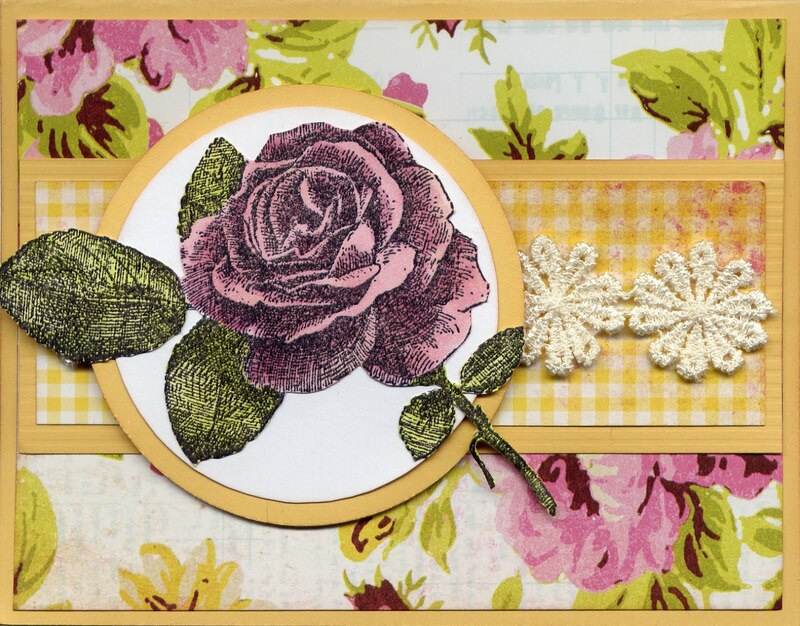 A touch of ribbon, from Websters Pages, for embellishment and it was ready to share! The FranticStamper staff and design team would like to wish you and yours a very happy Thanksgiving. 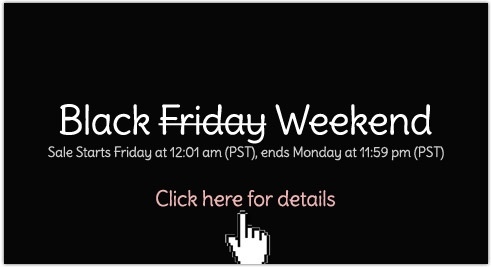 And we wish you happy Black Friday shopping as well. Jennifer used Copic markers to color the gorgeous large Lait Pur image by FranticStamper. 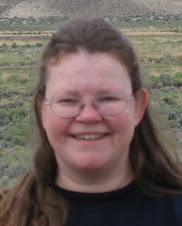 Recently I had a birthday to go to for one of my nieces. I love the idea of giving handmade items letting the other person know just how much time an effort you put in to telling them that you care. That's why I decided to decorate a plain craft gift bag for her myself. The bag I had was white already so I began by masking out the centre of the bag for my focal image (it's easy to do with a large post it note, or in my case several!) Next, I stamped the entire surface, front and back, with a newspaper stamp ( French Newspaper Background from the Frantic Stamper line of stamps) and tea dye Distress ink pad. I then spritzed the entire surface so that the ink feathered slightly and while the surface was still damp, I rubbed faded jeans and peeled paint distress inks across the surface. I chose not to blend the colors neatly because I wanted a jagged kind of feel much like I imagined it would be like underwater. Once the bag had completed dried, I stamped the Sea floor stamp (also from the Frantic Stamper range of stamps) in the centre masked section (I removed the masked bits first though). I then colored this in with a selection of Copic markers before adding in a strip of mesh (I prefer to use Drywall tape its far cheaper than anything else you can buy) some strips of green mulberry papers, pins and string to finish decorating the front of my bag. 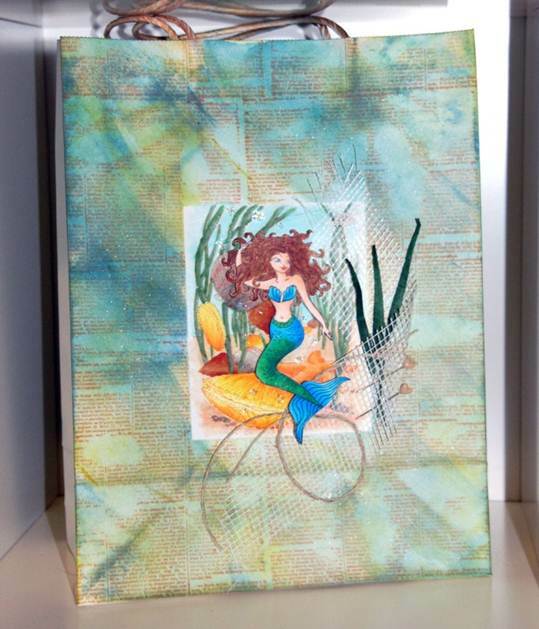 Finally I added a cut out Mermaid image that I made by stamping (the stamp is also available from the Frantic Stamper line of stamps) and coloring, using some foam pop dots so that she stood out from the sea floor scene. So, that's how I created mine. I'd love to see any gift bags that you created for your family. Sorry for the delay in posting. Sometimes real-life just catches up with us! 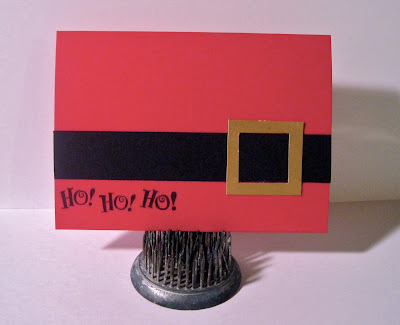 We have a fun card video for you from Julie Ebersol and Hero Arts today. 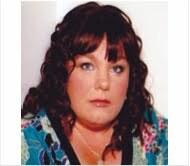 All of the products used in the video can be found at www.franticstamper.com. Enjoy! One other thing that I did that is difficult to see, I sprayed the whole image with a light spray of a silver Glimmermist to add sparkle and I colored all the bubbles with clear Ice stickles. Happy Father's Day! We hope you will each have a wonderful day in celebration of the fathers in your life. Here is the sketch for today. Note that there is a layer of patterned paper (either purchased that way or created), and a SHAPE (not necessarily a star). 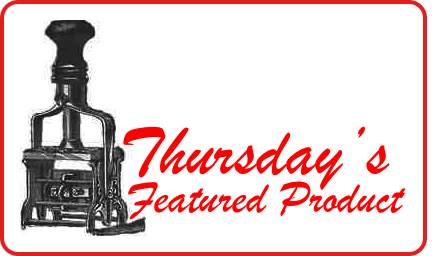 Today we would like to share a few cards from members of the Frantic Stamper Design Team. 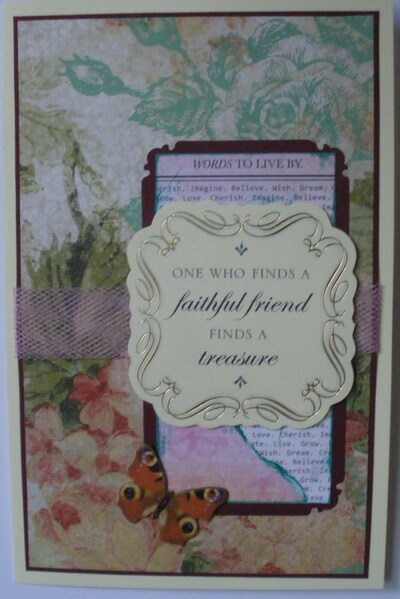 First up is a card from Sharon Jeffs. 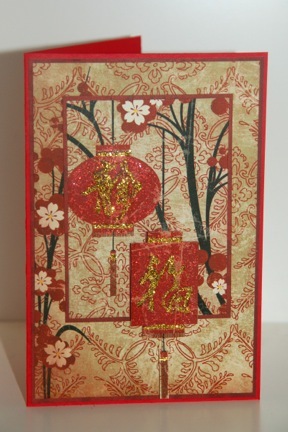 Sharon chose an Asian inspired theme for her card. Next we have a card from Linda Phinney. 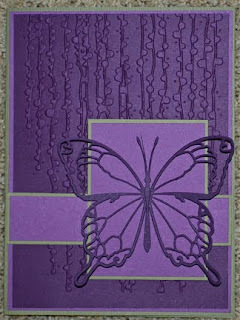 Linda used a Memory Box Chloe butterfly die and Couture Creations embossing folder to create her card. Lastly, DT Alternate Member Lis used Kaiser Craft papers These Days and Tigerlilly. Many times, I am guilty of using a stamp one time and then putting it away only to never see it again. However, Frantic Stamper's Lg Rose image is timeless allowing it to be used over and over - not just lost in a sea of rubber. Today I would like to share one of the ways the image could be used. Cut the yellow card stock to 5.5"" x 8.5" for a card base, and fold in half. Cut the floral printed card stock to 4" x 5.25" and ink the edges with cocoa ink and adhere to the front of the card front. Cut a strip of the yellow card stock to 2" x 4" and ink the edges with cocoa ink. Cut a strip of the yellow gigham side of the printed card stock to 1.75" x 3.75" and ink the edges with cocoa ink. Adhere the gingham strip to the yellow strip and attach to the center of the card front. Adhere the floral trim to the gingham strip. Punch a 3.25" circle from the yellow card stock. Punch a 3" circle from the white card stock, attach to the yellow circle, centering. Attach the matted circle to the card front with foam tape, positioning it off-center and left. 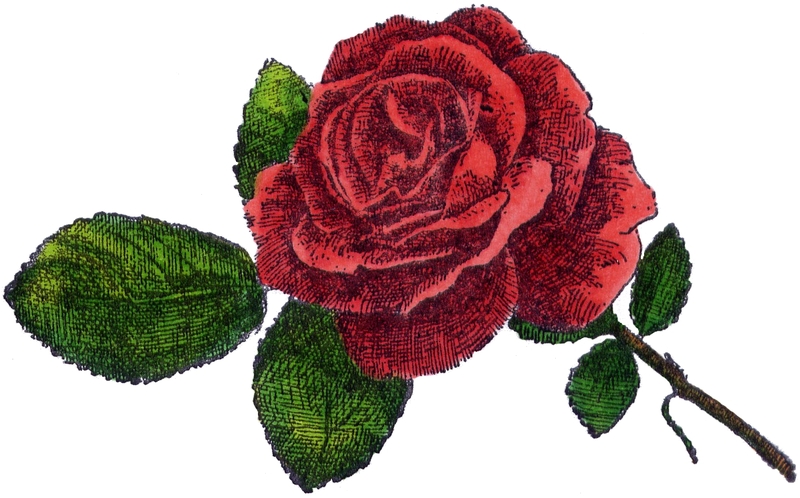 Stamp the rose onto white card stock. Color the rose using the RV000 on the open areas and RV34 on the shaded areas, then coloring over the flower with R81 and R85. Use the greens for the leaves and stem. Neatly trim out the rose and adhere to the matted circle, use a small bit of foam tape on the stem. 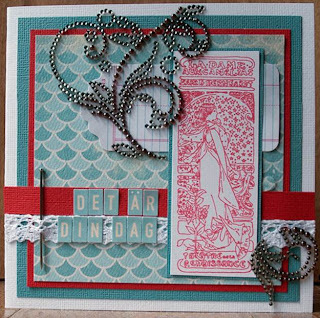 Here is a great yet SIMPLE card using Memory Box dies. 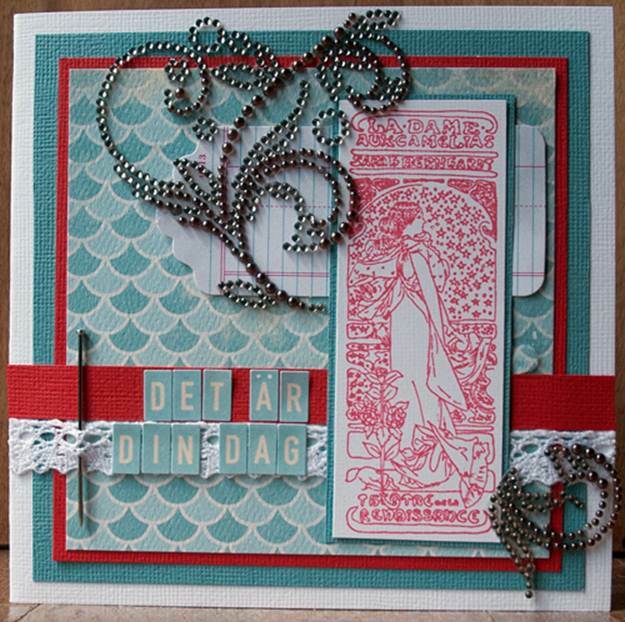 The technique of combining different dies to create a scene can be used with a variety of dies. We hope you will enjoy the card. Announced just today (and arriving June 19), Tim Holtz and Ranger are releasing a new set of SEASONAL LIMITED EDITION Distress Inks! The set contains 3 warm colors: Salty Ocean, Pickled Raspberry and Mowed Lawn. Of course, we are also getting refills for these 3 colors as well. PLUS.... we still have a good supply of pads and refills in the Spring colors, Winter colors, and refills only for the Fall colors at this time. We will be receiving 140 of the Summer 3-pad sets and 100 each of all 3 reinker colors. Pre-order today to reserve yours. We will ship as soon as they arrive - Pads estimated to arrive June 19th; re-inkers, on June 27th. This beautiful image stamped with Memento ink and colored with Copic Markers is from FranticStamper's own line of cling mounted stamps, Large Rose. It is a wonderfully versatile image, and it is just plain fun to color! 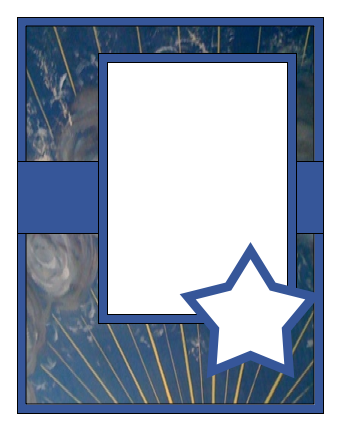 I'd love to share this card with you. 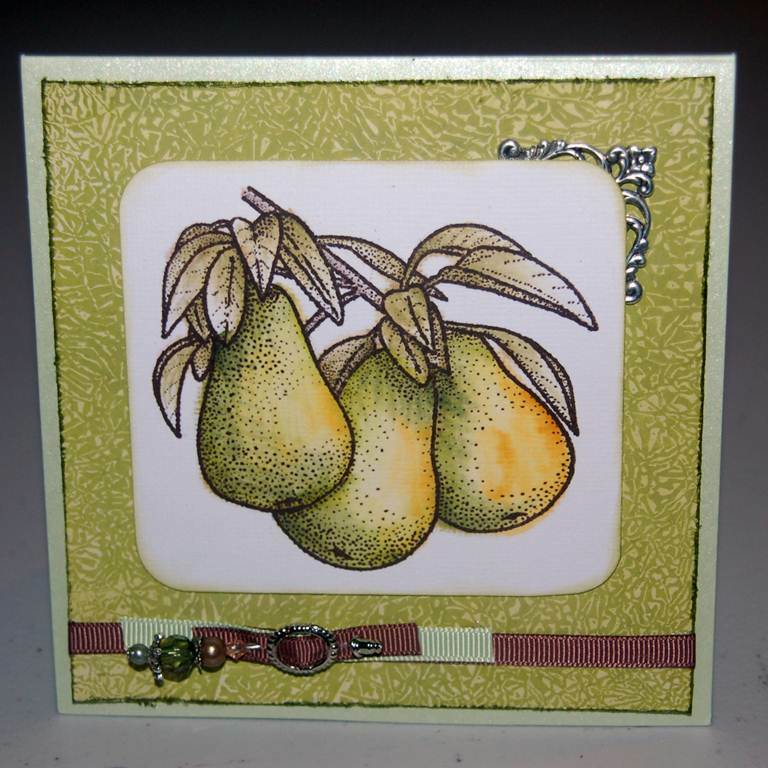 I colored my Frantic Stamper Large Pears image using an Alcohol ink Blending pen and dipping it into Adirondack Alcohol inks. To make the background, I inked up a piece of glossy card with Shabby Shutters Distress Ink then ironed a piece of crumpled wax paper ovedr the top before re-inking with Peeled Paint Distress ink. I love the orange peel kind of texture this technique leaves! Today Tim Holtz shares photo tinting with Distress inks and the new Ranger Nibs and Nib Holders, available at www.FranticStamper.com. We hope you enjoyed today's video and will visit our blog again soon. A while ago, I received yet another GREAT DT-package from Fran. This time it contained beautiful papers from what has become one of my favorite producers: Authentique! The collection is called “Fresh” - and the color mix red, turquoise and white is my absolute favourite all times! You can find the complete collection at www.FranticStamper.com. I LOVE those papers; I had a blast working with them! It has kind of a sea/beach theme and will be perfect for your summer photos. But as they are double sided, you will, just like me, find them super versatile! The stamp used on my card is one from Fran´s own collection, Frantic Stamper Cling Mounted Stamp: Lg Dame. This is a page I recently scrapped using papers from the awesome Kaisercraft collection Tiny Woods. To create a similar page you will need the Oak, Pine and Cyprus papers. Other special items I also used are a decorative border punch from Martha Stewart and some chipboard scraps. Using the Pine sheet as the base, the left side of the page has several layers. First there is the distressed red from the Cyprus paper, I cut it about 2.5" wide and punched a decorative edge along the entire length. The next layer is the front side of the Cyprus paper cut about 2" wide and also punched. The final layer is the decorative information strip cut from the bottom edge of the Oak paper. The decorative elements are all from the Oak paper. First I roughly cut each image out, adhered them to the chipboard and then trimmed each out leaving a small border around each. Add a touch of Memento Cocoa ink to the edges finish them off. 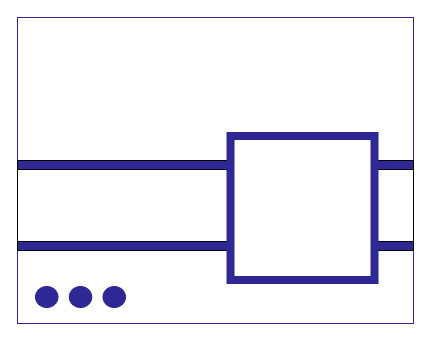 Attach them randomly along the right side of the page. To finish up, trim your pictures and mat them on coordinating paper. Create journalling on some coordinating paper strips. I hope you have enjoyed your visit today, thanks for stopping by! Today we offer a truly simple sketch that elicits clean and simple design, and a return to the basics. We hope you will enjoy the sketch and give it a try. A few of our design team members did, and here are there offerings. First we have a lovely card from Linda Phinney. Linda used a piece she made using aluminum cut from a can, a Cuttlebug embossing folder (Floral Fantasy) and Vintaj Ranger Patina in Clay and the Vintaj Patina glaze. Next we have two cards from Kathy Berger. The first card uses the Frantic Stamper Cling-Mounted Rubber Stamp - Strawberries colored with Copic markers, a small scrap of red patterned paper, and three small pearls to create a clean and simple card. 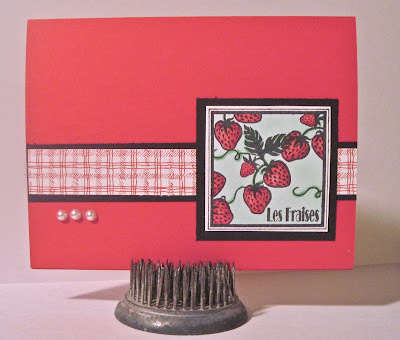 When Kathy was making the first card, the black strip on the red background reminded her of something else, and so this fun and extremely quick second card was created. 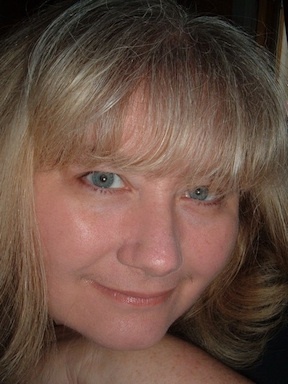 Kathy didn't mind that it was a Christmas-themed card in June, since she thought that perhaps some readers might share her habit of making Christmas cards throughout the year to avoid a holiday crunch. 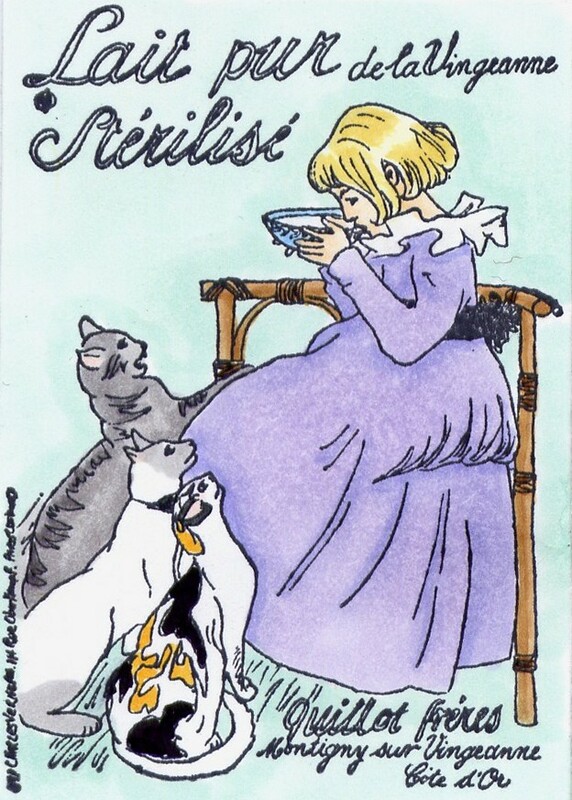 And lastly we have a fabulous masculine card by Jennifer Willis. 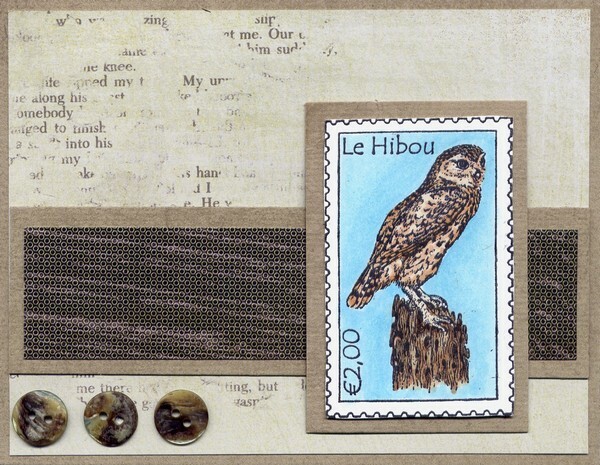 She used the Frantic Stamper Cling-Mounted Rubber Stamp - Owl Postoid stamp colored with spectrum noir markers, and papers from the Basic Grey (What's Up Collection to create this simple yet incredibly striking card. 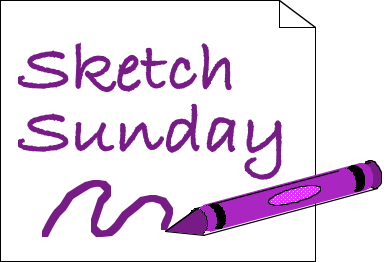 If you are inspired to create a card with this sketch, please send a quality photo to franticstampersketchphotos@yahoo.com and we will add it to this post. This card started out as a play on George Rodrigue's Blue Dog, and ended up having a desert evening kind of vibe. This how most of my projects end up. 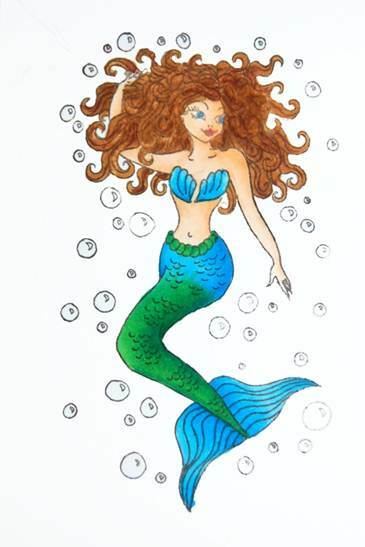 As described on Tuesday in the Coloring Corner post, spritz cold press water color paper with water then with Adirondack Color Wash in Denim and Sailboat Blue, and Glimmer Mist in Jazz Blue and Blue Skies. Stamp Frantic Stamper Cling-Mounted Rubber Stamp - Lg Sitting Short Hair cat on paper created above three times with Colorbox Pigment Ink in Black and sprinkle and emboss with Judikins Detail EP in black. cut out one cat, one cat front (head and legs), and one cat head. Highlight cat's chest fur on cat front and tips of ears on cat head with Adirondack Color Wash in Wild Plum. Highlight chin, cheeks, and bridge of cat's nose on cat head with white pigment pen. Mount cat front and extra head on base cat with foam tape. Create background on grey card stock spritzing Crafter's Workshop Templates 6"x6" Zinnia with Adirondack Color Wash in Eggplant, Sailboat Blue and Glimmer Mist Jazz Blue, layer on black and then purple folded cardstock, also punch 2/14" circle out of this piece, layer on black cs (I used pinking shears on the black cardstock), mount on card. Mount cat on card/background with foam tape. Create sentiment with KaiserCraft - 2.25"x3" clear stamp - You're Simply the Best on the grey spritzed card stock, layer on black, mount on card.